With Happy People: A Year in the Taiga, Werner Herzog – celebrated director of Grizzly Man – takes us on another mind-altering journey into wild and extreme natural landscapes. This documentary traces the lives of people living in the desolate heart of the Siberian Taiga. Far removed from civilization, 300 people inhabit the small village of Bakhtia on the banks of the river Yenisei, accessible only by helicopter or boat. They make their own skis and dugout canoes, and mostly live off the land. With no telephone, running water or hospital, the locals – many of them trappers whose routines have hardly changed over centuries, apart from snowmobiles – live according to tenacious values and traditions. “These people resemble early Man from a distant ice age,” says Herzog. With commentary written and narrated by the acclaimed German director, Happy People follows a Siberian trapper through four seasons to tell the story of a culture largely untouched by contemporary technology or values. 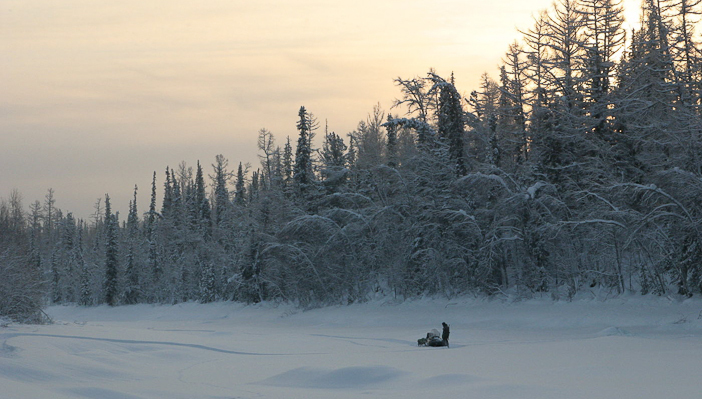 Still from Happy People: A Year in the Taiga.